OmniFocus helps me get things (like websites and other projects) done. It’s a powerful, digital tool for staying on top of just about everything I have to do. It’s my to-do list. On orange juice. If you have something already that works for you, great. If not, give it a look. It’s personal task management, on Mac- or i- OS. Getting Things Done. There’s a whole vocabulary for it. In the acronyms of life, GTD® is all the rage. In work (like making websites) as in life, there is the ever-present reality of managing what there is to do and get done. My dad always had a homemade “Day-Timer“, DIY style. I always had an assignment book. Then I graduated from high school. College brought a new but similar assignment book, and it also brought a Mac (the year was 2001; Mac OS 9). 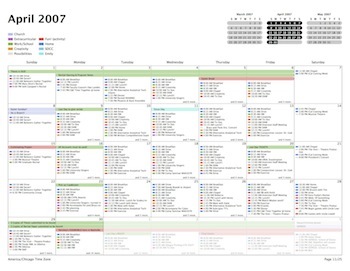 I made my own “day-timer” like dad, and by the time graduate school came around (2005) I was dabbling in iCal for my tasks and projects. Then the inevitable crisis came: iCal didn’t feel quite right for “to dos”. It was getting too crowded, overwhelming, and a little unmanageable. I was mixing the details of what with when. In life I have found that having a place for “What do I need to do today?” and “Where do I need to be today?” work best on/in separate applications/pieces of paper. One has to do with what (and all it’s details), the other has to do with when. The principles are too lengthy to explain here, especially since the OmniGroup has good resources introducing you to both the app and concepts associated with Getting Things Done®, but thinking through different approaches with guys who live this stuff can be helpful. If you’re overwhelmed, ask another or send me a note. OmniFocus is not as elegant as Things, but it is “far more powerful”. One final word: remember you are focused on getting these things done – not just managing and writing down things to eventually get done. If something like this helps your focus, then by all means. I’ve officially migrated to Things 2 (August 2012).